Deacon Jennifer Shack and Rev. Kurt Reinhardt. 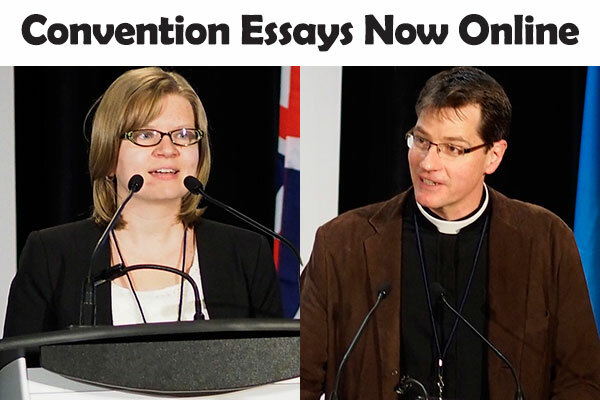 ONLINE – Lutheran Church–Canada is pleased to announce that the essays from the 2014 National Convention are now available for download. Rev. Kurt Reinhardt’s presentation—”As Dear Children Ask Their Dear Father”—focused on prayer. The two-part essay is available for download now as a pdf. Rev. Reinhardt’s presentation was accompanied by two hymns written specially for the occasion. The first of these—As Dear Children of the Father—is now available for download. (Check back later for the second hymn). Deacon Jennifer Shack’s presentation—”The History and Biblical Foundation of Lutheran Church–Canada’s Diaconate—is also now available to download. Get the pdf here. Deacon Shack’s presentation was accompanied by a Powerpoint, which is also available for download (as a zip file). You can also watch both presentations online. Watch Rev. Reinhardt’s presentation here (Part 1 and Part 2). Watch Deacon Shack’s presentation here. Video from the convention’s opening worship service is also now available online. To watch video of the convention’s seven sessions, visit synod2014.lutheranchurch.ca/convention-session-videos-online/.